A 74-year old Caswell man was swept downstream and drowned Tuesday night. A 74-year-old Caswell man died Tuesday after being swept into a culvert by fast-moving floodwaters in the road in front of his home. Paul Oliver, had moved his truck across a flooded portion of Oliver Road and was walking through the water back to his house when he apparently stepped into the opening of a large culvert that was covered by water and was swept downstream at 9:20 p.m., the Maine Warden Service said. 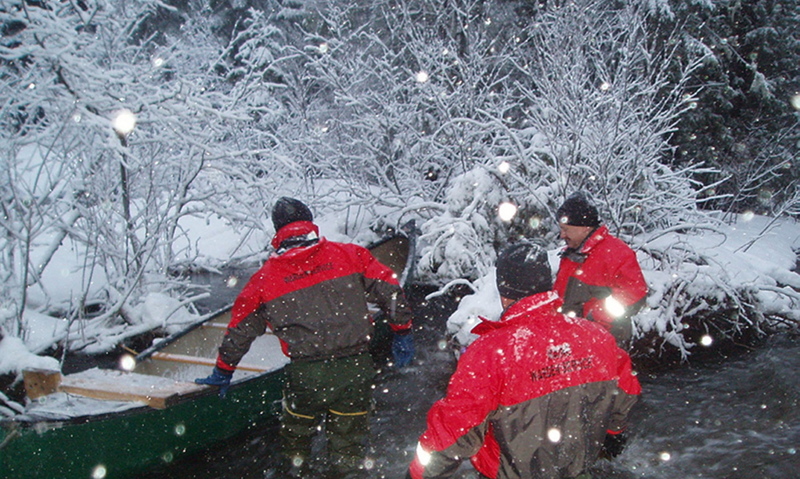 His body was found by game wardens at 5:35 a.m. about 20 yards downstream from the road. Maine experienced flooding statewide and was likely to remain under a flood warning until late Thursday or early Friday because of heavy rains Tuesday combined with melting snow, state emergency officials said. On Tuesday and into Wednesday morning, the rain turned to snow, leaving an inch or more across much of the state, most of which had melted by the end of Wednesday in coastal areas. The National Weather Service in Gray reported that several rivers in western Maine had exceeded flood levels by Wednesday, spilling over their banks and covering nearby areas. In Augusta, the Kennebec River was at 17.35 feet at 6:15 p.m. Wednesday, more than 5 feet above the flood stage of 12 feet. 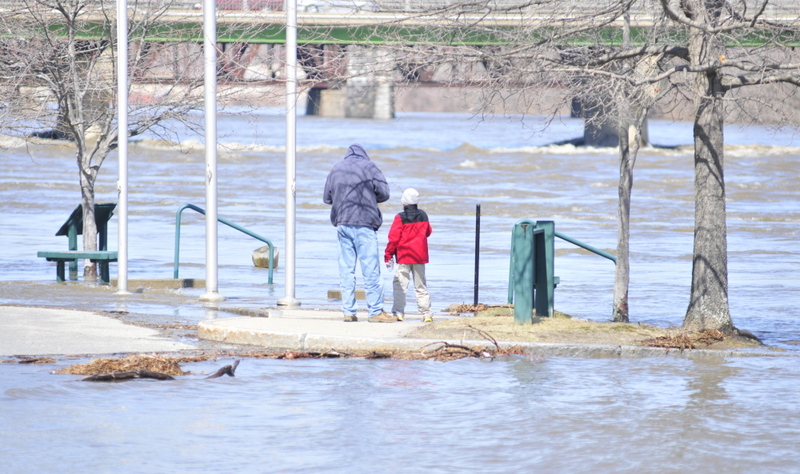 River levels were expected to peak at 18.22 feet at 10 p.m., according to the Weather Service. The Kennebec River flooded parking lots and parks and spilled into several riverside building basements in Augusta on Wednesday, but damage appeared to be minimal. Bond Brook in Augusta also was running high and fast Wednesday evening. Streets near the river in both downtown Augusta and Hallowell were covered in water and closed to vehicles Wednesday and were expected to remain so into Thursday. The flooding was nothing new to those who’ve made their living in buildings on the edge of the river for decades. Water was still several feet from Burnett’s building around 4 p.m. Wednesday. She had warned tenants of her upstairs apartments to remove their belongings from storage bins in the basement and had the motor pulled out of her furnace. In 1987, water rose past the level of the barbershop floor, completely covering its back deck, and flooded up and across Water Street, making it passable by canoe, but not much else. The river is expected to begin to recede early Thursday morning. In downtown Dexter, the Dexter Historical Society Grist Mill Museum, which dates to 1854, teetered over the Sebasticook River, where a large section of road was washed out, creating a dropoff of about 15 feet to the water. On Main Street, the Fire Department spent most of Wednesday afternoon pumping out the Town Office, which is also built above the river. Dozens gathered to watch the river Wednesday afternoon as emergency workers tried to keep the damage from getting worse. 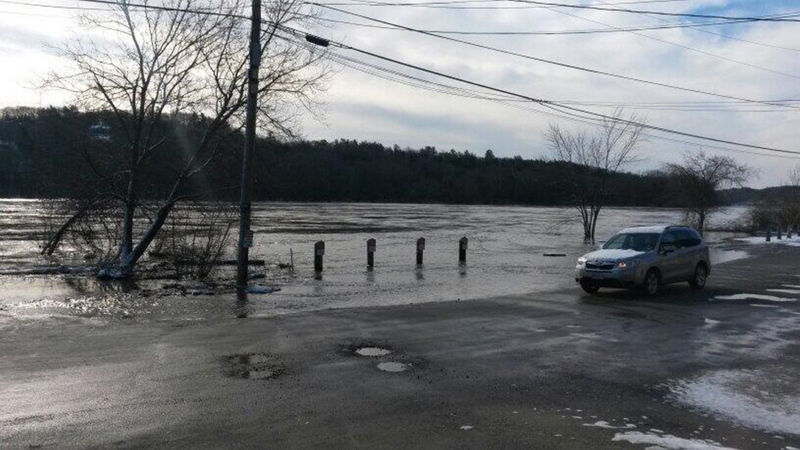 Flood watch remained in effect for the Androscoggin River in Rumford, which was at 16.3 feet at 4 a.m. Wednesday morning, more than a foot over the 15-foot flood stage, the weather service reported. It was forecast to rise to 17.3 feet Wednesday morning before falling below flood stage by Wednesday afternoon. The National Weather Service canceled the flood watch for the Swift River in Roxbury and the Carrabassett River in North Anson on Wednesday. The weather service was keeping watch on the St. John River that runs along the Canadian border for ice jams that could dam the river and cause flooding, the Associated Press reported. It’s been at least six years since snow fell as late as April 16 in southern Maine. The weather service said the snow was the latest snowfall in southern Maine since the Patriot’s Day storm of 2007. The Weather Service reported the following snowfall totals overnight in southern Maine: two inches in Naples, 1.6 inches in Freeport, one inch in Gorham and 0.6 inches in Hollis. Rainfall totals in Maine ranged from 0.35 inches to 1.72 inches, according to the National Weather Service. Keith Edwards of the Kennebec Journal and Rachel Ohm of the Morning Sentinel contributed to this story.